The Dragon Kingdoms game is a fascinating new Playtech entry into the online slot games arena. This five-by-four slots game has 30 pay lines and each line can be bet at $0.10, $.020, $0.50, $1, and $5, allowing bets to run the gamut from $0.10 to $150. The Dragon Kingdoms jackpot is 25,000 coins multiplied by the line bet, for a truly amazing jackpot possibility. This exciting bet spread and high value jackpot makes this game attractive for players at any budget level. The Dragon Kingdoms slots game features vivid fantasy graphics of dragons, warriors, princesses, and treasures. The colorful graphics are augmented with exciting winning animations that are sure to please the most discerning game player. 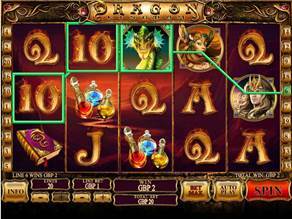 Dragon Kingdoms features the Playtech dragon’s egg split feature. When the dragon’s egg appears on the fifth reel of a winning spin, a baby dragon hatches from the egg and breathes fire on the last symbol of each winning combination. This splits the symbol into two identical halves, each counting as a separate reel. This increases the value of any winning combination by one symbol, with the potential to convert a five-symbol winning combination into a six-symbol winning combination. During the standard game, this split applies to all symbols except for the jackpot symbol. During bonus play, the dragon’s egg split applies to all symbols, creating the possibility of the six-symbol jackpot combination for maximum winnings. During normal play, if the Dragon Kingdoms scatter symbol appears on reels two, three, and four, free games are awarded. These fifteen free games are at higher payouts, with multipliers of x2, x3, x4, or x5. After each winning spin during the bonus round, the multiplier increases by one. However, after each non-winning spin, the multiplier decreases by one. If the Dragon Kingdoms scatter symbol appears in columns two, three, and four during the bonus games, this retriggers the bonus and adds 15 more free spins. There are no limits to the number of times the bonus spins can be retriggered, creating the potential for infinite bonus games. Following the bonus game, players have a chance to win even more by wagering some or all of their winnings in a bonus card game. The combination of stunning graphics, stacking bonuses, and additional card games makes Dragon Kingdoms an exciting addition to the Playtech online slots line sure to thrill players.